Each year Kent County Council selects an artist to send on a short residency to Veranka, a nature reserve island in the Danube, three hours out of Budapest. The artist spends time on the island, working alongside artists from nine other European countries, in a unique ecological environment that has deer, wild boar, black herons and rare wild plants. The artists each have their own cabin and can spend their time in isolation or in closer community with the other artists. Most importantly they are given the time and space to develop their art practice and explore new directions for their work in relation to the protected natural environment of Veranka. The Hungarian trip complements the landscape work that Nicholette Goff has been involved in for the past four years at Marle Place Gardens, "my studio has been the woodland floor, the formal gardens and the compost heap, where I select and organize plant material to find an image that conveys something about the site or the season. 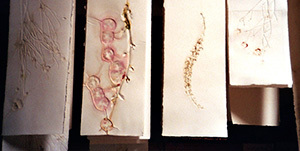 The paper picks up colouring, texture and embossing unique to that place and that time. Being on Veranka made me more aware of the care taken to conserve such a remarkable place. Since I have returned I have become more concerned about plant development and survival here in England. Are we aware of the changes already underway in the landscape; changes that come about as a result of social and political developments, as well as climatic change? What will disappear? What will be introduced?" Prints from Vita Sackville-West's garden at Sissinghurst Castle Garden were made from December to June. 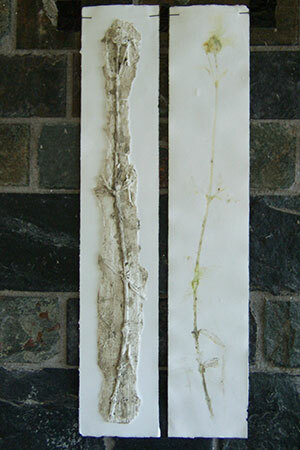 The mellow colours and strong textures of the plants in winter are imprinted on the surface of the paper. They hang from beams in the exhibition room alongside a book of poetry and prints by children from Frittenden Primary School, who worked with Nicholette Goff and poet, Maggie Harris in the grounds of Sissinghurst Castle as part of Kent Big Read. Five larger prints, dropping four meters from ceiling to floor, were made in June specifically for a room in the tower.